Hypnotherapy is a powerful tool. Use it to stop smoking, to conquer anxiety, to stop depression, to lose weight, to rid yourself of fears and phobias, to improve self-esteem and confidence, or to program yourself for success. Brainwave is Susanna Sweeney, Galway based Clinical Hypnotherapist and accredited psychotherapist with 20 years experience helping people transform their lives. These are the main issues why people attend a hypnotist in Galway, yet there are many other things that hypnosis is benefical for. Think of hypnosis as a minor miracle that can wave a magic wand and enable you to break through your perceived limits to a new level of well-being, confidence, success and much improved relationships. Hypnotherapy is all about empowering you to live your life to its fullest potential. Hypnotherapy is a form of therapy that uses a trance state of varying depths to access the persons' subconscious mind. The purpose of accessing the subconscious mind is to deactivate unwanted, redundant programming which is causing the client difficulties by producing symptoms in their everyday lives, and following on from that to reprogram the subconscious mind with up-to-date and desirable programming. If you think of the human mind like a computer for a moment, then what hypnotherapy does is it de-fragments the hard drive, updates the software, and installs brand new software. Hypnotherapy, when done right, is a very powerful tool which can help to resolve a wide variety of issues. There are mixed reports however from clients who have attended a hypnotist. I am sure you will have heard both sides. One group of clients swear by it. Hypnotherapy has resolved all the issues they came for and they are happy customers. There is another group of people though for whom hypnotherapy only worked partially or not at all. This can be due to a combination of factors. Firstly, not all hypnotists work in the same way. There are some at work who do not have any in depth training. These often 'specialize' in Stop Smoking sessions. They may travel the country booking hotel rooms to practice in. Some do group sessions, often charging people the same price other hypnotists would charge for an individual session lasting two hours. They don’t tailor sessions towards the needs of the individual. Sessions could be short enough also, perhaps an hour or even less. I have even heard stories of hypnotists who perform sessions without any kind of a hypnotic induction. People often leave these sessions with no results whatsoever. Unfortunately the entire profession's reputation has suffered as a result. So, when picking a hypnotherapist, always check their training and credentials. Secondly, if you are looking to resolve deeper issues, such as anxiety, phobias, panic attacks and depression, or if you want to improve the symptoms of IBS, always make sure you pick a practitioner who works with regression hypnotherapy and who you feel comfortable with. Make sure the practitioner has experience working with regression successfully. If you are attending hypnotherapy with a complex issue such as a fear, anxiety, phobias or depression, remember that any amount of suggestion therapy, no matter how fancy or impressive the packaging, most likely isn't going to do the job on its own. Again, this may account for some client's dissatisfaction with the treatment they had. If a complex issue is treated with only suggestion therapy, it will most likely return, even if there is some improvement initially. Or, if the client felt they could not let go with the practitioner, or trust them fully, then the issue might have been resolved only in part or not at all. Thirdly, you as the client have a part to play in the success of the hypnosis treatment also. When you book a session, really be sure that you are ready. Sometimes there are conflicting parts at play in our minds. For example a part of the person might want to stop smoking, but only because their partner is constantly complaining about the habit, yet another part knows that they will smoke again as soon as they can. If that is the case, there is no point booking a Stop Smoking session. So, be sure you are one hundred percent ready for the change, and that every part of you is embracing the idea. I don't think I can be hypnotized. Believe it or not, most people believe they cannot be hypnotized. In my experience, hypnosis is a learned process. Anyone can be hypnotized, if they want to be hypnotized that is. And in every successive session they can learn to go deeper and to go deeper even faster. The deeper the client goes, the more work I can do for them. Here are some guidelines, just to give you an idea, however it's always best to call me and have a chat as every programme will be tailored for the client's individual requirements, monitoring your progress as we go along. With me, a Stop Smoking session is a once-off two and half hour session. An individually tailored Weight Loss programme will consist of four to six sessions of two hours in length. The exact treatment plan will be the outcome of my in depth consultation with you the first time we meet. 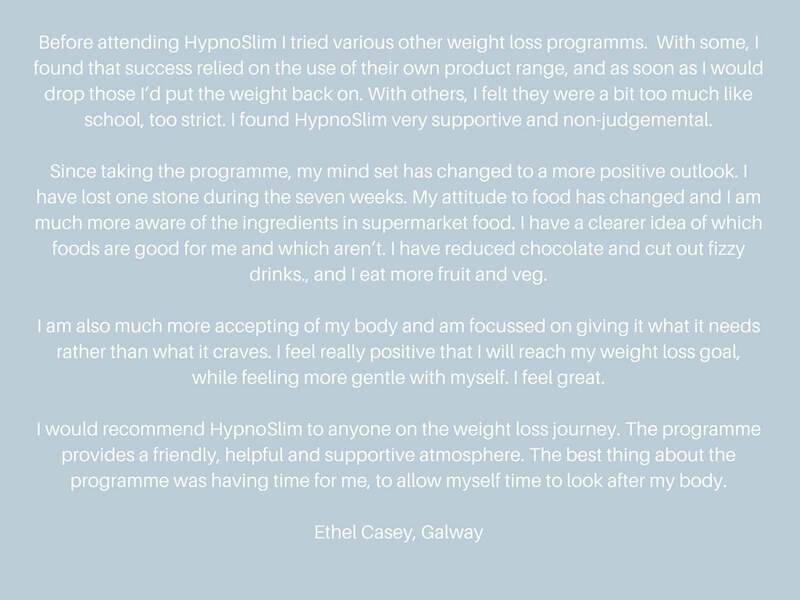 Do look out for my HypnoSlim classes though which will work out much cheaper for you and can be combined with two individual sessions if you feel you need them, which will be specifically for the purpose of resolving the underlying causes of the weight gain. A programme for overcoming anxiety or depression will take approximately three 2 hour sessions. For the complete removal of fears or phobias I would recommend two to 2 hour sessions. For self esteem and confidence programmes I recommend three to four 2 hour sessions. With the amount of sessions recommended above, you can expect a complete internal makeover. You will experience tremendous relief from symptoms, and you will be in a great position to achieve your goal (no matter what that goal may be) and to enjoy life. What to expect when I come in for my hypnotherapy session? The sessions will take place in a confidential setting. The environment is comforting and relaxing. The first session starts with an in depth consultation. I will be looking to find out a lot of information on your particular issue which will all help with the treatment plan. After that the session will start with an introductory talk and a couple of exercises to introduce you to the idea of hypnosis. Before the actual hypnosis induction I will ask for your permission to be hypnotized. You are in control all along. At the end, I will gently emerge you and you will leave feeling relaxed and refreshed. Will I be asleep when I am in hypnosis? No. Hypnosis and sleep are two different things. During hypnosis, your mind is much more alert than it normally is during the waking state. Your brain will be in a state where superfast learning can occur. You will remember most parts of the session very clearly afterwards. I am afraid of being out of control during hypnosis. Many people have this fear. The notion of being out of control during hypnosis often stems from the experience of stage hypnosis shows where people have seen the stage hypnotist turning members of the audience into chickens, or making them perform other embarrassing things on stage. It has to be said though that hypnosis is always a consensual act. A hypnotist can only hypnotize someone when the person is in agreement with going into hypnosis. And when you are in hypnosis, you still always have the choice to end the process. All you'd have to do is open your eyes. When a stage show comes to town, think of all the excitement in the build up to the show, and the air of expectancy. A lot of people will volunteer to go on stage because of this atmosphere. Of all those who volunteer, the hypnotist will pick only those that he can hypnotize most easily. And that is why the effects that you will see on stage can look so dramatic and impressive, but all those people who volunteer in the end of the day did so of their own free will and were in agreement with having fun on stage. During a hypnotherapy session you will have full control. Hypnosis will only happen with your agreement. It is your choice also how much of the new ideas and suggestions you will accept into your subconscious mind. Those ideas or suggestions you are not ready for or that you simply decide you don't want you can simply reject. It is also your choice how much of your feelings or memories that may come up in the session you will disclose to the practitioner. Your mind will be so much more alert and that's why you will find it easy to know exactly which memories or feelings or exactly how much of these memories and feelings you will want to share with the hypnotist. Actually that's the reason I am emphasizing the point that you should pick someone you feel confident in and comfortable to work with, so that you will feel okay about disclosing at least a certain amount, which will be vital for the success of your session and treatment. Brainwave Hypnotherapy Galway can be contacted at 086 3920466 to book an appointment or to discuss an individual treatment plan for you.